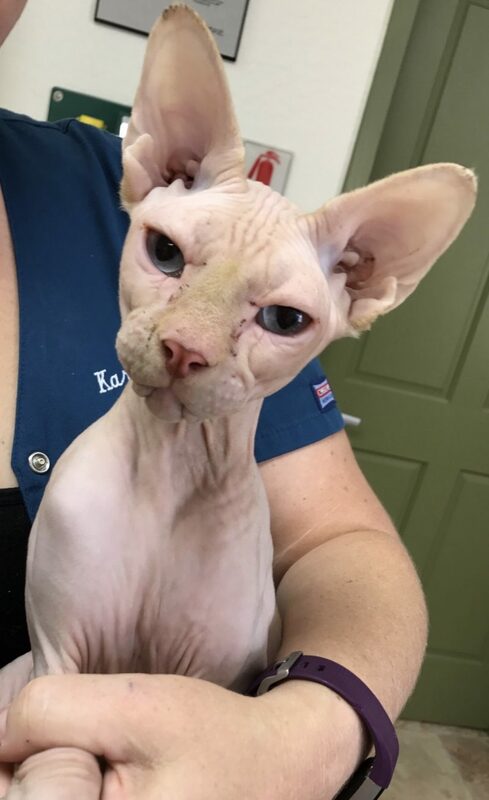 Our unique patient of the month is Rory, a 3-year-old sphynx. One early morning Rorys’ mom discovered that he had fractured one of his upper canines. After his initial exam, Rory was scheduled for a procedure to not only assess the extent of the fracture, but also how best to repair it. At that time, it was discovered that Rorys’ tooth was indeed a complicated fracture with exposure to the pulp chamber. Dr. Force discussed her findings and options for repair with Rorys’ mom and together they decided that the best option for Rory was to extract the tooth. What makes Rory a bit more complicated is that he has a history of Hypertrophic Cardiomyopathy (HCM) a relatively common heart disease found in domestic cats, frequently found in many purebreds, including the sphynx where genetics is thought to play a role. HCM causes a thickening of the left ventricle of the heart and subsequent enlargement thereby decreasing the hearts efficiency. Because of his condition, Rory is considered a high-risk anesthetic patient and requires advanced monitoring which is one of the main reason he was brought to us for his care. Rory was anesthetized using a protocol safer for our more complicated patients with HCM. He was carefully monitored by our wonderful and well trained staff; his procedure went well and he recovered nicely. Rory continues to do well at home and is a much happier kitty.